In my previous entry, I touched a bit on the ability of QR codes on shared bikes, as a convenient and very cheap way to get around major cities. 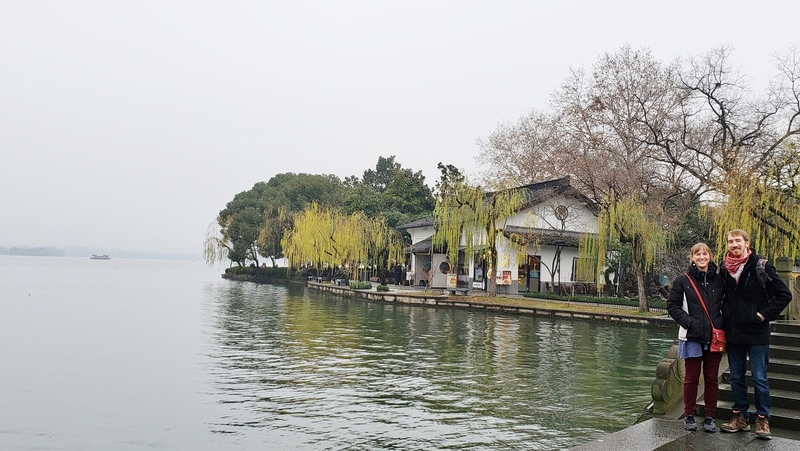 Shanghai has 24 million people in it, but we also visited the nearby Hangzhou, which “only” has 7 million people in its urban core. We saw bike share prices ranging from 10 yuen cents per hours, to one yuen per hour. As of this writing, a yuen is worth about 15 cents… so yeah, pretty cheap. The bullet train to Hangzhou was cheap too, 88 yuen one-way. Clean and spacious, with somber-faced apron-wearing attendants quietly mopping the floor of footprints after each stop. On initial startup, the train would glide forward slowly, with none of the creaking and clanking noise of wheels grinding against tracks that we associate with trains. 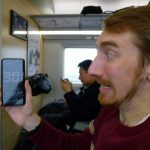 It took quite awhile to get from Shanghai Central Station to the Western station, at a pretty low speed for safety. But once out of the city, we got our first and only chance to glimpse at how rural Chinese people live. Bearing in mind too, that these folks were still only a 20-30 minute drive outside the city so we can’t truly classify them as rural as I know still so many Chinese villages exist hours away from major cities! 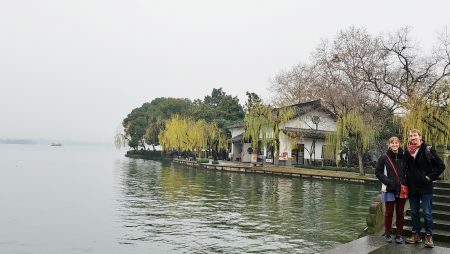 The houses I saw though, were palatial mansions in comparison to the small apartments that the average Shanghai citizen would be able to afford. Daniel told us that Shanghai is one of the most expensive cities in China, and that housing costs are outpacing food and transportation. I told him it was similar in the USA: more than those two things, space to live in is something you can’t just import or create, so prices are skyrocketing. But these outside-Shanghai houses seem to rejoice in their expansive land options, and building 3 story homes, even though plain and unadorned on the outside (most were of the simple vertical rectangle style) they had plenty of space! Farms and rice paddies seemed to be the norm. Within 10 minutes outside the city, the train had increased its speed up to the rated 300 kilometers per hour and the vibrations and noises had increased to what Amtrack customers would probably classify as “normal” – I’ll admit it wasn’t the face-melting experience I might have been hoping for, but it says a lot for the quality of engineering that 300kph felt slow and comfortable, and I wanted to say “what, this is it? 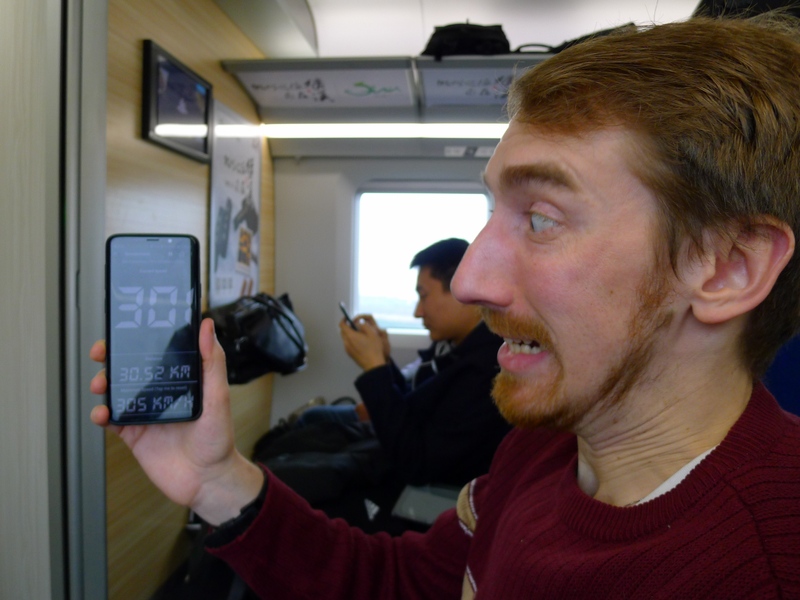 This baby feels like it could go so much faster!” However, Hangzhou is only an hour away at 300kph so really, by the time we got up to speed, we only got to keep at that pace for a few minutes before we were already gracefully slowing back down again to reach the first stop on the outskirts of the “small” city. As you might expect, China has a few brands of car that we Americans have never seen stateside. The two most common that I saw were BYD – which literally means “Build Your Dream” – and Roewe. We got the opportunity to travel in a few of each via Didi Chuxing which, like how Google Maps and Whatsapp were forced out and marketshare taken over by Chinese equivalents, is the same sort of rideshare concept as Uber and Lyft. Since Didi is Chinese for “little brother” I thought it might a play on the concept of calling your little brother to pick you up from a party because you’re too drunk to drive yourself. Cute name! Little brothers are great, especially when they comment on your blog all the time. But Daniel laughed and pantomimed honking a car horn… “deee… deee” Oh, I guess that works too. Both brands impressed me with their opulence and of course, technological connections. I had Daniel grill the drivers on numbers regarding the cars – how old was this model we were in? How much did it cost? What are repair fees like? The most memorable car was the Roewe sedan we took in Hangzhou which had a 12″ across touchscreen in its center console, just like Tesla cars have become known for. You pay a premium for a Tesla here in the USA (and I saw two Tesla dealerships in Shanghai!) but according to the 3 drivers I spoke to, their high-tend vehicles were between 120-160 thousand yuen, which is about $17-23k. BYD is also known for producing a lot of hybrid cars at low cost, as these license/registration fee for these vehicles are cheaper than gas (more on that later). You can recognize hybrids around the country by a special green-into-white gradient colored license plate. Finally, most of the BYD and Roewes I saw had a constantly running rear camera running and displaying content in a 2×2″ square in the right side of the rearview mirror. I’m guessing that rear-end collisions are not uncommon in these huge cities, and having video footage of at-faults is basically mandatory. Speaking of rear cameras, I was mightily impressed by a minor thing – every single parking lot we saw (and we saw a lot; Shanghai is a big and rich city compared to the rest of China) was filled with cars all neatly parked with their noses facing forward. I pointed this out to Daniel, saying that in the USA, I’ve never seen so many thousands of cars all taking the time to back carefully into cramped little parking spaces. 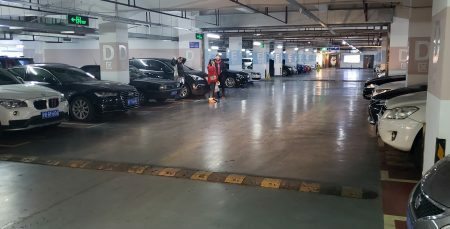 He pointed out that the backup camera makes it a lot easier, that there’s not a single driving test in China but instead 2-3 practical and 1-2 theoretical: proper and skilled parking is a necessity. Not only that, but he specifically mentioned wanting to avoid backing out where there could be people walking around. The discussion ended there, but I recalled reading a Slate news article (and then later, a Snopes about that article) that says that Chinese courts will often strictly take the side of the pedestrian/victim in almost all collision cases, leaving the driver liable for a lifetime of payments. Regardless of the accuracy of that article (and note that Snope calls the murderous aspect of that article merely unproven, not false), Daniel did explicitly tell me that he backed into parking spots so as to have less chance of hitting someone by backing out later. I’ve never seen such a politely parking people. Oh the mopeds, though. 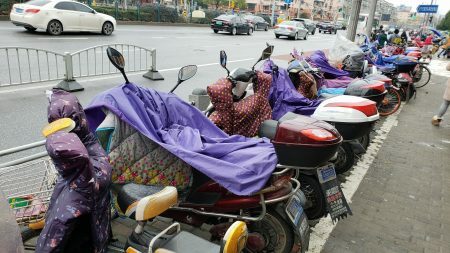 If the car drivers are polite parkers, then the moped drivers of Shanghai are deranged and believe no laws apply to them. Every day, throughout the day, we were forced to dodge out of the way from grim-faced moped drivers driving on the sidewalk. And at night time, they’d be driving on the sidewalks with all their lights off. To make matters worse for our safety (but better for the environment) Daniel told us that gasoline mopeds/motorcycles are essentially banned by the city because the license for them costs the equivalent of “around ten thousand dollars,” he told me. Fresher air… but no warning engine rumble! So instead, everyone is on these utterly silent, unlit 80kg collision machines, on the public sidewalks. Apparently the license fee for electric bikes is the equivalent of a couple dozen USD. I can’t find any official Chinese sources on those license fees in a few minutes of fruitlessly VPN-googling, so I’ll have to leave it at that. I speculate that the reason the majority of scooter drivers I saw in Shanghai were driving with their lights off is because they believe that it will save their batteries. Since they’re not gas powered, only electric, there’s no alternator to recharge the usual lead-acid battery you’d find in a gas powered vehicle, that would only be used for things like lights. Who knows; perhaps these unsafe, crazy drivers really do eke out another 5-10km by not using their lights. But then, when you also consider that I constantly saw them making right turns directly through pedestrians trying to go through a cross walk, plus the insane driving on sidewalks part, in their silent vehicles… is 5-10km between charges really worth it? They did look pretty adorable in their moped rain gear, though. As it rained every day for us (except the one day in Hangzhou, thankfully) we had plenty of chances to see the different protective suit style. In Madison, Wisconsin, a college town in a cold part of the USA, you’d think this might be a prime place to see people keeping their hands warm and their bodies dry, but perhaps “adorable” isn’t what your average moped-riding college student wants people to think when people look at him. I mean, if people would at least smile before running me over instead of glaring grimly, it’d be a little better. I drove Becca’s gas moped a few times when she was on externships in 4th year, and it definitely had some zip. 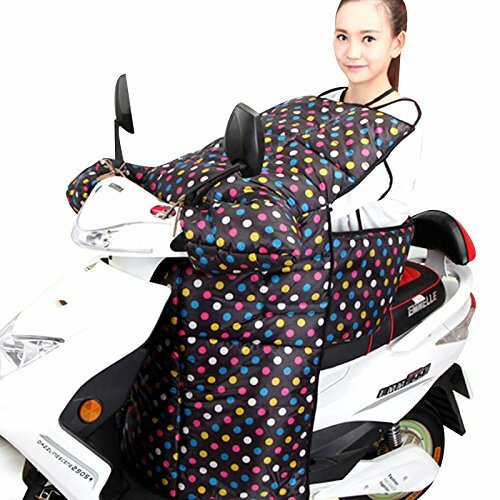 Did the chinese moped riders wear any kind of helmets?